Sureswari temple or Sursuri temple is located at the left bank of Tel River towards the south-west of the confluence of Mahanadi and Tel River. This temple is located in the temple town of Sonepur, Subarnapur district, Odisha, India. 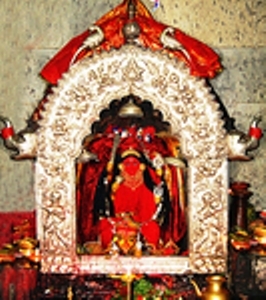 The presiding deity is maa Sursuri and well known as one of the oldest Shakti shrine. The word Sureswari is the sankritised version of Sursuri.Sureswari Temple is regarded as the oldest Shakti shrine in Sonpur.Devi Sureswari is also the presiding deity of Sonepur.A six handed standing image of Kali is worshipped in the sanctum of the temple as Sureswarai. It is situated on the left bank of Tel River towards the south-west of the confluence of Mahanadi River and Tel. The main gate of the temple faces towards east but Devi Sureswari looks towards north. SevenPonds are found by the temple side of Sureswari. According to many scholars these ponds were the fort moats of the Kalachuri rulers. Devi Sureswari was the presiding deity of the fort of Chauhan ruler Achal Singh Deo who was the builder of that historic temple. But after that Maharaja Biramitra Singh Deo constructed many images of parsvadevatas. In the parsvadevata niches, there are images of tenhanded dancing Durga, four-handed Devi sitting in lalitasana and eight-handed Ganesa all on the Visvapadma pedestals. Standing image of Bhairav and tantric Buddhist goddess named Tara are kept here and there all around the temple. It is also believed that Lord Parashuram, on request of his mother, performed a sacrificial yagna here. There is an ancient and big altar in the temple which is believed to be that of Lord Parashuram. The present temple was built by the Chauhan king, Achal Singh Deo.